Registration is now open for the annual Winter Dance Workshop held by the Department of Dance in Webster University’s Leigh Gerdine College of Fine Arts. Held Feb. 7, 10 a.m.-4 p.m. in the Jean and Wells Hobler Center for Dance, the workshop invites high school students to participate in classes taught by Department of Dance faculty, enjoy lunch and discuss college life. Tuition for the event is $100 and includes a complimentary lunch. Registration information is available online. 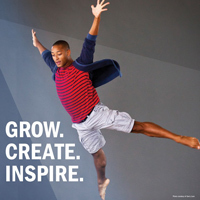 For more information on the Winter Dance Workshop or Webster Dance, call 314-246-7747 or email dance@webster.edu. The Winter Dance Workshop consists of four classes each an hour and fifteen minutes in length and also includes complimentary lunch. Ballet with Maggi Dueker, 10:15-11:30 a.m.
Modern with James Robey,11:30 a.m.-12:45 p.m.
Jazz with Jennifer Huffman Olivas, 1:30-2:45 p.m.
Aerial with Monica Bremer, 2:45-4 p.m.
“The amount of inquiries we received for the 2015 Winter Dance Workshop was abounding, and with the growth of the program and faculty, I anticipate registration filling quickly this season,” Robey said.